Claims: See dark spots begin to fade in just 14 days. Key ingredients: Idebenone and Soy-Ferulate-C (Feruloyl Soy Glycerides and Ascorbyl Glucoside). 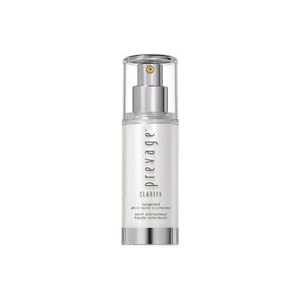 Claims: Dark spot correcting, age repairing. Hexylresorcinol and spergularia extract: anti-dark spot action, evens skin tone. Cochlearia and waltheria extracts: firming and anti-wrinkle action, help to restore complexion luminosity. 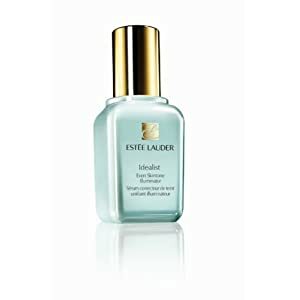 Claims: The first fast-acting Serum from Estée Lauder Research proven to dramatically reduce the look of uneven skintone: redness, acne marks, dark spots, sun spots, discolorations. CorrectTone Technology visibly reduces uneven skintone in 2 weeks, while anti-oxidants help prevent its re-appearance. My comments: Triple-Optic Technology gives you a subtle glow just by adding some shimmer in the product, which is nothing but a cosmetic effect. The ingredients that can possibly reduce discoloration are: several plant extracts, salicylic acid, a form of stabilized vitamin C (ascorbyl glucoside), acetyl glucosamine (has inhibitory effect on melanin production) and yeast extract. Estée Lauder has added pretty much all non-hydroquinone ingredients that have research showing their effects on skin discoloration. Claims: Faster dark spot reduction in just 4 weeks. Clinically-proven against the leading prescription ingredient. Key ingredients: hydrolyzed soy flour, yeast extract and salicylic acid. Claims: in clinical trials our serum was comparable to a leading prescription ingredient in creating a more even skin tone-a verified 53% improvement. 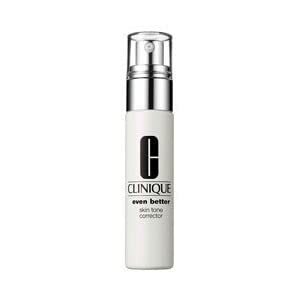 Key ingredients: the same as Estée Lauder Idealist Even Skintone Illuminator except that this one does not have the cosmetic shimmer. Water, Glycerin, Dimethicone, Butylene Glycol, Caprylyl Methicone, Feruloyl Soy Glycerides, Ascorbyl Glucoside, Tetrahydroxypropyl Ethylene Diamine, Cyclohexasiloxane, Hydroxydecyl Ubiquinone, Palmaria Palmata Extract, Petasites Japonicus Root Extract, Sodium Hyaluronate, Lactic Acid, Cetyl Palmitate, C12-15 Alkyl Benzoate, Glyceryl Stearate, Isohexadecane, PEG-40 Hydrogenated Castor Oil, Propylene Glycol, Sodium PCA, Trehalose, Urea, Octadecenedioic Acid, Acrylamide/Sodium Acryloyldimethyl Taurate Copolymer, Ceteareth-20, Cetearyl Alcohol, Cetyl Alcohol, PEG-100 Stearate, Stearyl Alcohol, Polysorbate 80, Sodium Laureth Sulfate, Polyquaternium-51, Xanthan Gum, Disodium EDTA, Mica, Cyclopentasiloxane, Parfum/Fragrance, Alpha-Isomethyl Ionone, Linalool, Benzoic Acid, Butylparaben, Ethylparaben, Isobutylparaben, Methylparaben, Phenoxyethanol, Potassium Sorbate, Propylparaben, Sorbic Acid, Chlorphenesin, Iron Oxides, Red 4, Titanium Dioxide. Water, Glycerin, Methyl Gluceth-20, Butylene Glycol, Sodium Polyacrylate, Phenoxyethanol, Hexyresorcinol, Sodium Hyaluronate, Fragrance, Biosaccharide Gum-1, Atractylodes Lancea Root Extract, Citric Acid, Cochlearia Officinalis Flower/Leaf/Stalk Extract, Spergularia Rubra Extract, Cedrelopsis Grevei Bark Extract, Tiliroside, Sodium Benzoate, Palmitoyl Dipeptide-5 Diaminohydroxybutyrade, Ascorbic Acid, Red 4. Aqua/Water/Eau, Propylene Glycol, Glycerin, Diisopropyl Sebacate, Methyl Gluceth-20, Dimethicone, Octyldodecanol, C13-14 Isoparaffin, Tocopherol, Sodium Hydroxide, Hydrolyzed Soy Flour, Hydroxyisohexyl 3-Cyclohexene Carboxaldehyde, Stearic Acid, Phenoxyethanol, Faex Extract/Yeast Extract/Extrait De Levure, PEG-100 Stearate, PPG-5-Ceteth-20, Ethylparaben, Ellagic Acid, Palmitic Acid, Polyacrylamide, Salicylic Acid, Helianthus Annuus Seed Extract/Sunflower Seed Extract, Xanthan Gum, Benzyl Salicylate, Ginkgo Biloba Extract/Ginkgo Biloba Leaf Extract, Linalool, Mentha Piperita Extract/Peppermint Leaf Extract, Benzyl Alcohol, Alpha-Isomethyl Ionone, Acrylates/C10-30 Alkyl Acrylate Crosspolymer, Rosa Centifolia Extract/Rosa Centifolia Flower Extract, Cetyl Alcohol, Methylparaben, Tetrasodium EDTA, Butylphenyl Methylpropional, Laureth-7, Glyceryl Stearate, Glycyrrhiza Glabra Extract/Licorice Root Extract, Parfum/Fragrance. Water, Dimethicone, Isododecane, Cyclopentasiloxane, Polysilicone-11, Butylene Glycol, Ascorbyl Glucoside, Peg-10 Dimethicone, Turmeric Root Extract, Rice Bran Extract, Grapefruit Peel Extract, Barley Extract, Wheat Germ Extract, Birch Bark Extract, Cucumber Fruit Extract, Dimethoxytolyl Propylresorcinol, Scutellaria Baicalensis Root Extract, Mulberry Root Extract, Trametes Versicolor Extract, Saccharomyces Lysate Extract, Yeast Extract, Peg-6, Tromethamine, Salicylic Acid, Polysorbate 20, Cholesterol, Isohexadecane, Propylene Glycol Dicaprate, Sunflower Seedcake, Caffeine, Tocopheryl Acetate, Acetyl Glucosamine, Simethicone, Glycyrrhetinic Acid, Polysorbate 80, Sodium Hyaluronate, Di-C12-18 Alkyl Dimonium Chloride, Sodium Rna, Squalane, Sodium Sulfite, Sodium Metabisulfite, Caprylyl Glycol, Hexylene Glycol, Ammonium Acryloyldimethyltaurate Vp/Copolymer, Acrylamide/Sodium Acryloyldimethyltaurate Copolymer, Disodium Edta, Phenoxyethanol, Yellow 6, Yellow 5. Thank you. I am the one that does everything. And Caudalie Vinoperfect Anti-Dark Spot And Radiance Set. And Philosophy Miracle Worker Dark Spot Corrector.